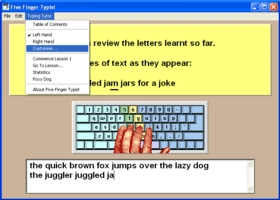 Five Finger Typist is a typing tutor for people who want to learn to type with one hand. 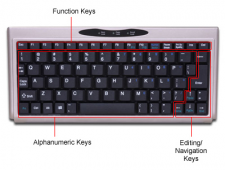 It teaches the accepted keyboarding technique for one-handed touch typing on the standard (QWERTY) keyboard. Learn a life-long skill which can be used on any computer, tablet or phone. No need for a specialised one-handed keyboard which has to be transported around with the user. Five Finger Typist is a set of structured typing lessons which first teach the home position and then progressively introduce new keys while revising keys already learnt. 21 lessons teach all letters, numbers and some punctuation marks. An animated hand on the screen shows the correct hand movement as keys are typed. You can save your typing hand, the last lesson worked and other settings so you can start next time with the same setup. Five Finger Typist is extremely easy to use. It's not necessary to master complex concepts to use the program. Mac OS 10.3 and later (including Mac OS 10.11, El Capitan) running on both Intel and PowerPC processors. Version 2.2 for Mac OS X coming soon. The advent of personal computers has made touch typing an important skill. Five Finger Typist teaches one-handed touch typing for both the right and left hands. The hand to be used is easily chosen. The guides drawn over the keyboard illustrate the keyboarding technique for the one handed typist. They show the keys struck by each finger. Key strokes are all made from the home position. Assuming you are using the left hand, all keys to the right of the guides are struck with the first finger. Keys to their left are struck with the little finger. The keys between the guides are struck with the second, or third, finger reaching up, or down, from its home key. If you are using the right hand, the role of the first and little finger is reversed. 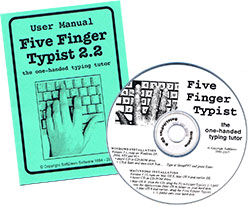 In Five Finger Typist the first 3 lessons introduce the home keys and the technique of one-handed touch typing. Thereafter each new lesson teaches two new characters, or is a revision lesson. In each lesson there are about 12 lines of exercises which initially teach typing of the new characters in relation to the home position. Overall there are 21 lessons which teach all letters, the numbers and the grammar keys . , - ; and return. The early lessons are a little boring as not many letters have been learnt so the exercises are mechanical and repetitive. However, words, phrases and sentences are included as quickly as the known letters allow. When you type, the hand on the screen shows the correct hand movement. You can easily choose the hand you want to type with - click on "Right Hand" to change from left hand (the start-up default). "Customise..." allows you to change the screen font size from standard to large, or medium and to turn on audio of keys typed and typing errors. Use "Go To Lesson..." to move backwards and forwards between lessons to practice particular letters. Click on "Statistics" to check your typing accuracy. Print what you have typed at any time.